When sending your shipments to Webinterpret it can be beneficial to pack all your Webinterpret parcels into one single shipment to send them back to the Webinterpret hub, See below for the steps covering how to do this in Zenstores. The first thing we need to do is print off labels for all the shipments that you'd like to send to each Webinterpret hub address. 1. First of all group together all orders going to each Webinterpret hub address. You can do this by selecting each order in the order list using the checkboxes on the left-hand side. 2. Then we just need to create plain address labels for the selected orders. Just click, the "Create shipments" button and select Plain address labels from the select a "courier" options. 3. Now just select your preferred address label template from the Label type drop-down and click the Book shipments button. Please note: You can also ignore the Shipping method and tracking number fields as the correct Webinterpret data will be sent back to the sales channel when dispathcing. 4. This will then generate labels for you to print, to print them just click the Print labels button. Then once you have your labels printed you just need to pack up all your smaller parcels with the appropriate labels on them. Ready to be placed in your larger box for shipping to the Webinterpret hub. The next step is to pack all your smaller parcels into your larger box. Then once you've done this all we need to do is generate a manual order in Zenstores to create the shipment on. 1. 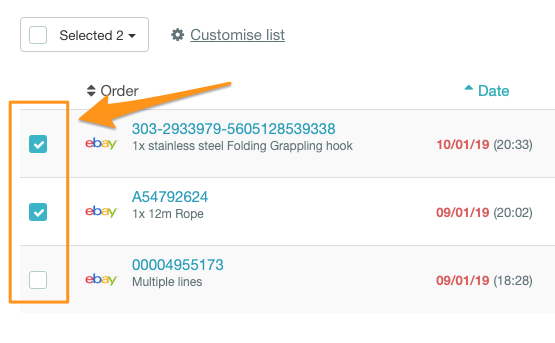 First of all click the "Create order" button on the top right of your Zenstores dashboard. The name always needs to be "Open Me" this is so that when the parcel arrives at the Webinterpret hub they know to open it up to access the actual Webinterpret shipments inside. The address of the Webinterpret Hub you are sending your parcels to. 3. Once you have input all the relevant info you can click the "Create order" button. 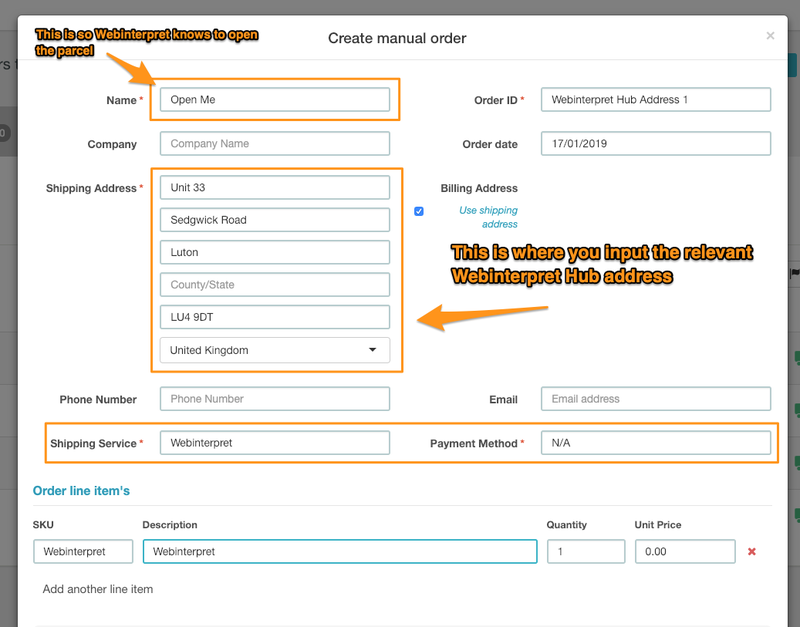 Now that you have created your manual order all you need to do is create a shipment for it, ready to send the whole package off to the Webinterpret hub. 1. 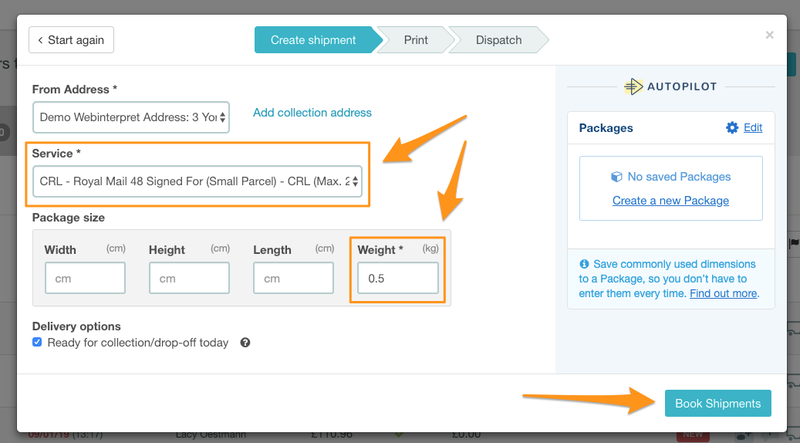 First of all select your new manual order and then click the "Create shipments" button. 2. From the courier list this time you will want to select your preferred courier. For many of our users this is Royal Mail. 3. Then just select your Royal Mail shipping service, input the parcel weight, click the Book shipments button and print your labels. 4. Then just place this label on your larger box that contains all your smaller Webinterpret parcels. 5. Now all you need to do is hand this off to your courier and Webinterpret will handle the rest on arrival.